Zeke helps celebrate the birth of a new cria. If you chat with a random selection of people who work at the OSU College of Veterinary Medicine, you will find that most of them like animals – not a big surprise. Even the staff who don’t work with animals – accountants, clerical support, lab technicians, etc. – often own one or two pets. Then there are the folks like Jill Pfaff. A microbiologist in the bacteriology section of the Veterinary Diagnostic Laboratory, Jill owns lots of animals, including 6 llamas, and is obviously very devoted to her furry family. Technically, the llamas are hairy, not furry, but they are a big part of her life. Jill grew up on Wild Bunch Ranch in southern Oregon where her family raised cattle, horses and pigs, and were very active in 4-H. She now volunteers, along with her partner Matt Gholden, as a 4-H leader with the Benton County Lucky Longneck Llama club. This keeps her and the llamas very busy participating in parades, competitions, and other events, including OSU Pet Day. One of Jill’s favorite llamas, Zeke, recently marched in the Corvallis Christmas Parade. He also joined ten 4-H kids and their leaders at Pet Day, where they are a very popular attraction, and patiently put up with a whole day of being petted by city folks. 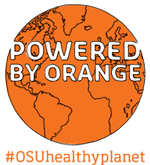 As a long-time employee of the college, Jill supports its mission in many ways. 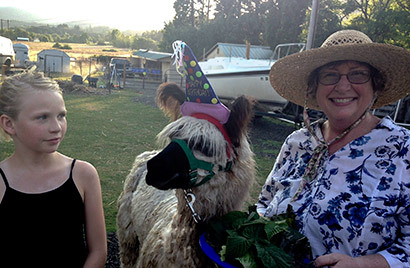 She has volunteered at the International Camelid Medicine Conference, held every other year in Corvallis. She also made an unusual but important contribution to student training. “We had to euthanize one of the llamas who had an unfixable tooth abscess that had deformed her jaw. We donated Marilyn to the vet school where they use her jaw in anatomy lab,” says Pfaff. 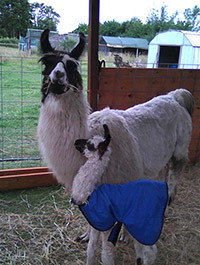 Jill recently welcomed a new llama to the family at Wild View Acre. His name is Wild View’s Lil’ Zeke, and the whole gang held a birthday party in his honor.